Almost all co-op apartments in NYC have subletting rules which apartment owners, also known as shareholders, must follow. A typical coop building in NYC will allow you to sublet your apartment for one or two years every few years. Most co-ops charge apartment owners a subletting fee, and it’s also customary for co-ops to require a new owner to live in his or her unit for one to two years before being permitted to sublet. Sublets are subject to co-op board approval. This means that there’s no guarantee you will be permitted to sublet even if you’re in compliance with the building’s subletting policy. Can You Sublet a Coop Apartment in NYC? What Types of Co-op Sublet Policies Exist in New York City? What Are the Typical Co-op Sublet Fees in NYC? Where Can I Find a Co-op’s Sublet Policy? How Is Subletting Different for Condos vs. Co-ops in NYC? Do Condos in NYC Have Subletting Restrictions? Sometimes. The specific sublet policies of co-op apartments in NYC vary widely by building. While most coops in NYC encourage high levels of owner-occupancy, most buildings do permit shareholders to sublet their units from time to time. 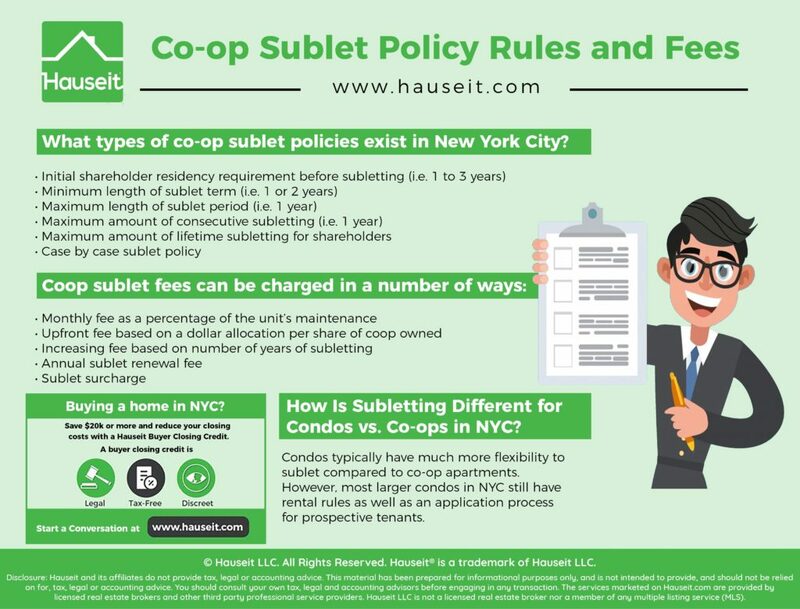 The most common sublet policy for co-ops in NYC allows one to two years of subletting after one to two years of initial occupancy by a shareholder (apartment owner). Most Common Sublet Policy: 1-2 years of subletting permitted after 1-2 years of initial occupancy by the shareholder. 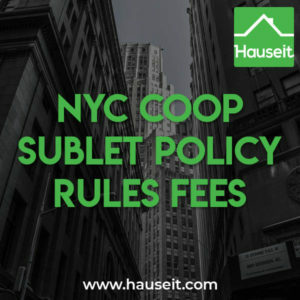 There are a number of different types of coop sublet policies in NYC. They range from outright prohibitions on all subletting at one end to unlimited subletting at the other end. In most cases, the actual NYC coop sublet policy falls somewhere in the middle of those two extremes. Almost all coops charge shareholders some sort of upfront or ongoing sublet fee in addition to the standard application, credit/criminal background check, and move-in / move-out fees. Pro Tip: Thinking of buying a co-op apartment in NYC? 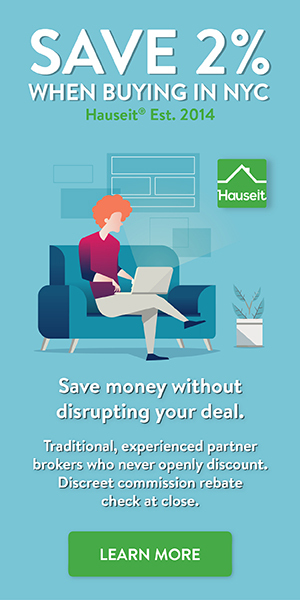 Read Hauseit’s Complete Guide to Buying a Coop in NYC. Many NYC coops impose an initial residency requirement on new shareholders before permitting them to sublet. This is designed to encourage owner-occupancy and prevent an influx of investors. In the most extreme cases, a coop will not allow a shareholder to sublet unless he/she has lived in the coop for at least three years. The most common initial residency requirement we’ve seen calls for initial, consecutive residency between one to three years before subletting is permitted. Once the shareholder satisfies the initial occupancy requirement, she or he may be permitted to either sublet for no more than 1-3 years during a 5-year period, sublet for 1-3 years during their lifetime of ownership, or sublet for an unlimited number of years. It’s important to note that board approval is always almost required for sublets. At a minimum, a co-op will usually require a shareholder to notify the managing agent of any proposed sublet before it takes place. Most co-ops in NYC impose minimum lease term requirements for sublets. This is designed to prohibit short-stay tenants or guests, such as those which originate from Airbnb and VRBO. It’s quite common in NYC for both co-op and condo buildings to have anti-Airbnb policies, as many owners find short-term sublets to be disruptive to the broader building community and quality of life. Short Term Sublets are allowed, as specified in the Proprietary Lease, for a term not to exceed thirty days and for a maximum aggregate total of ninety days per calendar year. Shareholders must notify the Managing Agent of their intent to sublet at least three business days prior to the proposed start of a short term sublet and provide identification of the intended tenant as well as contact information for both the intended tenant and the shareholder while not in residence. Lack of response from the Managing Agent before the start of the proposed sublet will be deemed acceptance of the sublet by the Board. The shareholder must be prepared to provide proof of service of the prior notice to the Managing Agent. Sanctions, including fines, may be assessed for violations as determined by the Board. The duration of the sublet should not be for more than one (1) year. The Board may in its sole discretion consent to further subletting for an additional period of one (1) year, if requested in writing at least thirty (30) days prior to the expiration of the current sublet agreement. Most co-ops in NYC impose restrictions on the maximum amount of consecutive subletting permitted before a shareholder (owner) must either move back into the unit, leave it empty or sell the co-op. Sublets are for a period of one year and may be renewed for a second year with Board approval. If a subtenant is approved for two consecutive years, a third year for that subtenant only may be requested. NYC coops which cap the maximum number of years of consecutive subletting usually restart the cycle after five years. For example, a co-op may permit up to two years of subletting in a five-year period. Once the sixth year begins, the shareholder will be permitted to sublet again. In other cases, some NYC coops prohibit all further lifetime sublets for the shareholder once he or she has used up the sublet allowance (i.e. 1-2 years). Some NYC coops have ‘case by case’ sublet policies, which means that sublets are only possible if there’s a very good reason. Most co-ops with this sort of policy discourage subletting, but they leave open the remote possibility of subletting for shareholders in the case of financial hardship or other extenuating circumstances. Most co-ops charge a sublet fee which is either a flat fee, a flat fee per number of co-op shares owned or a percentage of your monthly or annual co-op maintenance bill. Co-ops usually charge subletting fees as a way to raise revenue while also discouraging owners from subletting in the first place. Monthly fee as a percentage of the unit’s maintenance – the shareholder is charged an additional monthly fee such as ~25% of their existing monthly coop maintenance bill. Upfront fee based on a dollar allocation per share of coop owned – a shareholder is charged an upfront fee which is calculated by multiplying the number of shares allocated to his or her apartment by a per-share fee amount set by the co-op. This fee is usually charged upfront for each year of the sub-tenancy. Unauthorized sublet penalties – coops often levy fees against shareholders who engage in the practice of illegal subletting. For example, if a shareholder violates the sublet policy he or she may incur a penalty of twice the building’s sublet fee. All of the fee structures discussed above are charged in addition to the the standard application, credit/criminal background check, and move-in / move-out fees which are levied by both condos and coops. The easiest way to find a co-op’s sublet policy is to ask the listing agent or your buyer’s broker. If you are searching for a coop online, you may have realized that listing agents do not usually disclose the sublet policies in listing descriptions. Even if they mention the sublet policy in passing, it likely won’t be very specific and may exclude important considerations such as the amount of the sublet fee. Your buyer’s broker will typically request the sublet policy from the listing agent. If the listing agent is unsure or provides an overly generic summary of the sublet policy, your buyer’s agent may reach out directly to the co-ops managing agent. Coops also have other policies which vary from building to building, such as the house rules, alteration agreements, and NYC coop purchase application (board application) procedures. Given the complexity, it’s quite common to encounter NYC listing agents who aren’t fully aware of all of a co-ops various policies. As a buyer, it’s very important that you have accurate and complete information on a co-op’s various policies before submitting an offer. It’s especially important to familiarize yourself with the co-op’s financial requirements for buyers, as you’ll need to satisfy these as a precondition for receiving board approval. The best approach is to request all important policies in writing. This way, you can be sure that nothing is lost in translation between the co-op’s managing agent and the brokers working on a deal. Condos are are far more flexible for of home ownership which means you typically have much more flexibility to sublet compared to a co-op. However, most larger condos in NYC still have rental rules as well as an application process for prospective tenants. Compared to condos, coops generally encourage high rates of owner-occupancy and maintain a greater emphasis on the quality of the coop community. Therefore, coops almost always discourage excessive subletting through the restrictive sublet policies, fees and procedures we described above. This is why coops in New York City are not generally viewed as ‘investor friendly assets’. Condos, on the other hand, almost always have zero restrictions on an owner’s ability to sublet. Therefore, condos are much more desirable for investors who are looking for the optionality to rent immediately and/or continue renting and generating cash flow for an indefinite period of time. Because there are more coops than condos in NYC and the latter attracts both residents and investors, co-ops are significantly cheaper than condos. If you are looking for a primary residence or pied-a-terre, it’s typically less expensive to buy a co-op. Investors or buyers looking for a primary residence with optionality to sublet or hold as an investment indefinitely should elect for a true condo or a flexible condop, which is a hybrid between a condo and a traditional NYC co-op. Sometimes. The most common condo sublet rule in NYC stipulates a minimum 30 day lease term. Condo buildings are increasingly adopting similar regulations in an attempt to restrict short-term rentals originated on platforms such as Airbnb and VRBO. Larger condo buildings will almost always require unit owners and prospective tenants to submit a rental application to the condo’s board of managers along with an application fee and possibly a move-in deposit and/or move-in fee. The condo rental application itself in larger buildings can be extremely detailed and time consuming. In addition, the high application fees can make it more difficult for you to find a tenant. If you’re thinking of buying a condo in NYC for investment, it’s a good idea to review the sublet application and fee schedule for the building you’re considering. Despite the cost and inconvenience, the condo sublet application itself is merely a formality. This is because a condo board does not have the same leeway a co-op to deny a sublet application. Technically speaking, a condo board can only reject a prospective renter if the condo building itself agrees to rent the apartment from the unit owner on the same terms as negotiated with the rental applicant. Who Delivers Your Offer to the Seller? Can You Withdraw an Offer on a House?